By Keith Cowing on October 31, 2012 1:14 AM. "Frankly, the world's leading space-faring nation shouldn't have to pay Russia for rides to the International Space Station. That's not only an insult to the hundreds of women and men like me who have built a legacy based on, literally, reaching for the stars, but it also hurts the local economy and puts local jobs at risk at a time when Florida's unemployment rate is already higher than the national average." Keith's note: With all due respect, Gene, a little history lesson (not that you care): when George Bush decided to shut down the Space Shuttle program in 2004, there was a blatant and openly admitted gap in American human access to space that no American spacecraft - Constellation or otherwise - would have met under even the most optimistic scenarios until 2014-2018 (that date constantly slipped). Your good friend and ghostwriter Mike Griffin openly admitted that repeatedly. George Bush set us on the path to paying Russia to gain access to the ISS - regardless of what timeline you chose to refer to. He then proceeded to underfund Constellation and did not push Congress for funding so as to make it incapable of achieving its avowed goals. Under the plans now in place for NASA's commercial crew programs, there will likely be indigenous American access to space sooner than Mike Griffin would ever have achieved with his bloated, underfunded, and oft-delayed Constellation program. Let me suggest that you check your facts before you embarrass yourself further. By Keith Cowing on October 30, 2012 4:31 PM. "NASA is contemplating space journeys far beyond a near-Earth asteroid, the moon or Mars for its new heavy-lift rocket in development. The Space Launch System (SLS), as it is called, could instead visit the moon of Pluto or return samples from other outer planets." Keith's note: Curiously, not a word is mentioned in this article about the cost of these missions (both launching the SLS and building/operating the payloads). The reason for that omission is quite simple: there is no budget to pay for any of these proposed payloads - however cool, nifty, or useful they might be. By Keith Cowing on October 30, 2012 11:22 AM. "SpaceX currently has a $1.6 billion contract with NASA to carry out at least 11 more cargo resupply missions through 2016. Another company, the Orbital Sciences Corporation of Dulles, Va., has built a new cargo spacecraft under NASA contract and is preparing for a test flight next year. The best news from this first commercial flight is that the Falcon 9 rocket was able to complete its cargo delivery mission despite the loss of an engine. Although it was not perfect, the outing shows that private companies can carry out relatively mundane tasks like space cargo transport." By Keith Cowing on October 22, 2012 3:12 PM. "Blue Origin conducted a successful Pad Escape test last week at its West Texas launch site, firing its pusher escape motor and launching a full-scale suborbital Crew Capsule from a launch vehicle simulator. The Crew Capsule traveled to an altitude of 2,307 feet under active thrust vector control before descending safely by parachute to a soft landing 1,630 feet downrange." Why Doesn't NASA Mention The Jump From The Edge of Space? By Keith Cowing on October 15, 2012 6:59 PM. Keith's note: Buzz surrounding Felix Baumgartner's parachute jump from 24 miles, with a top descent speed of Mach 1.24, is still all over the media and clearly captured the public's imagination. 8 million people watched on YouTube - a new record. Tribute and parody YouTube videos have already gone viral (cats anyone?). Yet, other than a single tweet yesterday (unless I missed something) NASA has not said a single thing about this amazing feat. Yet there was constant mention by the news media as to how such a jump could lead to better spacesuits for NASA (among others). Alas, NASA was originally approached to participate in this activity but declined the offer to do so. Sources tell me that many NASA managers went out of their way to find ways to say "no" to this. Its now clearly possible for non-NASA entities to approach - and reach space - and do things NASA cannot do. And, after half a century, NASA's increasing absence from these efforts doesn't even seem to be odd anymore. Is this the end of an era - and the beginning of another? 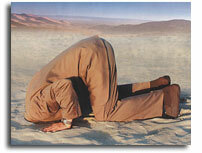 "So pay no attention to the naysayers. This was just as giant a leap as it felt. It reminded us that making a taller iPhone does not have to be the ultimate ambition of the technically minded. We can dare to look up from our Star Trek-inspired smartphones, gaze at the heavens, and dream of doing things that seem completely ridiculous." By Keith Cowing on October 15, 2012 11:46 AM. "Due to uncertainties in the business case and yet-to-be mitigated technology risks associated with the Reusable Booster System (RBS) concept, it is currently premature for Air Force Space Command to invest substantially in developing RBS, says a new report from the National Research Council. However, the report strongly endorses the continued research and advanced technology development needed for future launch systems and concludes that reusability remains an option in the future." By Keith Cowing on October 15, 2012 11:06 AM. "NASA partner United Launch Alliance (ULA) has completed the fifth and final milestone for its Commercial Crew Development Round 2 (CCDev2) agreement with the agency's Commercial Crew Program. The Hazard, System Safety and Probabilistic Risk Assessment detailed how ULA's Atlas V rocket launch system hardware would ensure crew safety during launch and ascent. "The ULA team did an outstanding job outlining how it plans to integrate its launch vehicle with completely different spacecraft designs," said Ed Mango, NASA's Commercial Crew Program manager." So ... What Is NASA TechPort and Why Can't We See it? By Keith Cowing on October 10, 2012 9:14 PM. "NASA's Technology Portfolio System (TechPort) is a new agency internal website now available to NASA civil servant and contractor employees who log in from a nasa.gov domain. TechPort is an integrated, agency-wide software system designed to capture, track, and manage NASA's portfolio of technology investments. TechPort provides detailed information on individual technology programs and projects throughout NASA. ... The Office of the Chief Technologist will seek employee feedback on the website, and plans to make TechPort publicly available in the future. Users will be able to browse, search, track, analyze and report on the portfolio of technology investments being pursued at program and project levels, with the resulting benefits being the easy access to information about programs and project results." Keith's note: Given the self-professed interest on the part of NASA to show taxpayers that there are many non-space ways that NASA-developed technology provides added uses (often and inaccurately referred to as "spinoffs") one would think that there'd be great interest in getting this sort of tool in the hands of consumers, taxpayers, developers, students etc. ASAP. As with the case of many online tools, crowd sourcing is often a great way to take a tool and make it better - by allowing the end-users to participate in the improvement process. I asked NASA when TechPort would be available to the public. They responded: "for the first year we plan on keeping TechPort internal. This is to both help familiarize the resource with employees and to encourage their use of it as a collaborative tool for tracking and managing projects and programs. After our "shake down flight" of TechPort, we hope to make it public -- in about a year." 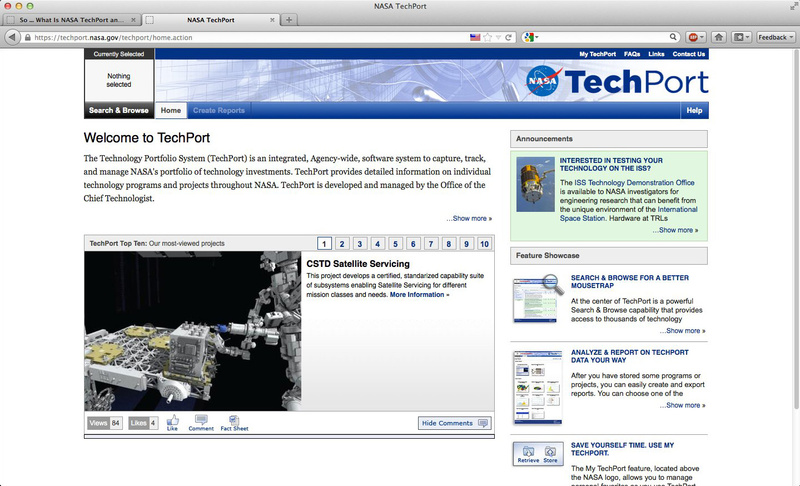 Keith's update: A NASAWatch reader sent this screen grab of TechPort. Larger view. Also, you would think that NASA's technology efforts would combine all of its established branded technology activities - including NASA Tech Briefs (with its existing subscriber base) - except ... NASA and NASA Tech Briefs make virtually zero mention of each other - and do not seem to be at all bothered by this mutual ignoring of one another. I decided to snoop around NASA.gov to see what I could find. According to the NASA.gov search function, this link http://www.nasa.gov/offices/oct/strategic_integration/tech_portfolio_tracking_detail.html used to point to "NASA - Technology Portfolio Tracking An Agency-wide process and system for tracking all of the significant technology investments, activities, and products by NASA." but now it simply points to the OCT home page. Continue reading So ... What Is NASA TechPort and Why Can't We See it?. By Keith Cowing on October 10, 2012 9:30 AM. "The SpaceX Dragon spacecraft has been successfully captured at the International Space Station. At approximately 6:56AM ET / 3:56AM PT, Expedition 33 crew member Akihiko Hoshide of the Japan Aerospace Exploration Agency used the station's robotic arm to grapple Dragon. Expedition 33 Commander Sunita Williams of NASA remarked, "Looks like we've tamed the Dragon. We're happy she's on board with us." By Keith Cowing on October 8, 2012 2:13 PM. "Space Exploration Technologies (SpaceX) today successfully launched its Dragon spacecraft aboard a Falcon 9 rocket on the first official cargo resupply mission to the International Space Station. The launch went off on schedule at 8:35 p.m. ET from Launch Complex 40 in Cape Canaveral, Florida. The SpaceX CRS-1 mission marks the first of at least 12 SpaceX missions to the space station under the company's cargo resupply contract with NASA. On board the Dragon spacecraft are materials to support investigations planned for the station's Expedition 33 crew, as well as crew supplies and space station hardware." "Approximately one minute and 19 seconds into last night's launch, the Falcon 9 rocket detected an anomaly on one first stage engine. Initial data suggests that one of the rocket's nine Merlin engines, Engine 1, lost pressure suddenly and an engine shutdown command was issued immediately. We know the engine did not explode, because we continued to receive data from it. Our review indicates that the fairing that protects the engine from aerodynamic loads ruptured due to the engine pressure release, and that none of Falcon 9's other eight engines were impacted by this event." "The OG2 prototype satellite, flying as a secondary payload on this mission, was separated from the Falcon 9 launch vehicle at approximately 9:00 pm EST. However, due to an anomaly on one of the Falcon 9's first stage engines, the rocket did not comply with a pre-planned International Space Station (ISS) safety gate to allow it to execute the second burn. For this reason, the OG2 prototype satellite was deployed into an orbit that was lower than intended. ORBCOMM and Sierra Nevada Corporation engineers have been in contact with the satellite and are working to determine if and the extent to which the orbit can be raised to an operational orbit using the satellite's on-board propulsion system." Continue reading SpaceX CRS-1 Dragon Launched and in Orbit. By Marc Boucher on October 4, 2012 10:36 AM. "Plenary Event 3 at the 2012 International Astronautical Congress in Naples focus was on commercial space transportation initiatives.The Plenary Event provided "a snapshot of the political, economic, and technical landscapes to best determine if, when and how much humankind could be ready to embark on futuristic scenarios based on massive space commercialisation." By Keith Cowing on October 3, 2012 1:13 PM. "NASA, the National Science Foundation and the Department of Energy's Office of Science announced on Wednesday the launch of the Big Data Challenge, a series of competitions hosted through the NASA Tournament Lab (NTL). The Big Data Challenge series will apply the process of open innovation to conceptualizing new and novel approaches to using "big data" information sets from various U.S. government agencies. This data comes from the fields of health, energy and Earth science. Competitors will be tasked with imagining analytical techniques and software tools that use big data from discrete government information domains. They will need to describe how the data may be shared as universal, cross-agency solutions that transcend the limitations of individual agencies." "NASA and Harvard University have established the NASA Tournament Lab (NTL), which with the enabling capabilities of the TopCoder community allow for competitions to create the most innovative, most efficient, and most optimized solutions for specific, real-world challenges being faced by NASA researchers. The NTL provides an online virtual facility for NASA researchers with a computational or complex data processing challenge to "order" a solution, just like they would order laboratory tests or supplies." "TechAmerica Foundation's much anticipated report "Demystifying Big Data: A Practical Guide To Transforming The Business of Government," which was released today, gives the federal government a comprehensive roadmap to using "Big Data" to better serve Americans." By Keith Cowing on October 2, 2012 12:19 PM. "The project is enabled through NanoRacks LLC, which is working in partnership with NASA under a Space Act Agreement as part of the utilization of the International Space Station as a National Laboratory. Says Managing Director Jeffrey Manber, "NanoRacks is delighted to again be working with the educational community, this time for showing students the potential of using space as a tool for learning." Keith's update: I have learned that NASA posted this article on the mining technology on 27 September and sent out one tweet via @Commercial_crew. Otherwise, no media alerts were sent out by email. If you saw the single tweet or happened to visit the commercial crew or KSC webpage, then you saw the article. Otherwise, you would not know where to find it. Meanwhile, the Odyssey Moon/NSL, Nanoracks news is till being ignored by CASIS and NASA. By Keith Cowing on October 1, 2012 11:18 PM. "Orbital Sciences Corporation Monday rolled the first stage of its Antares rocket to the launch pad of the nation's newest spaceport - the Mid-Atlantic Regional Spaceport at Wallops Island, Va. - while in Florida, Space Exploration Technologies (SpaceX) moves ahead with preparations for an Oct. 7 launch to the International Space Station for NASA's first Commercial Resupply Services (CRS) mission. These developments mark progress in returning space station resupply missions to American soil." This page is an archive of entries in the Commercialization category from October 2012. Commercialization: September 2012 is the previous archive. Commercialization: November 2012 is the next archive.